Idaho’s corps of part-time workers increased dramatically during the recession and has remained high even as the state’s economic recovery is gaining ground. Workers in part-time jobs accounted for over 24 percent of total employment in 2012 – 174,000 or nearly one of every four workers. That was up from just over 18 percent – 135,000 – in 2007 during the final spurt of the state’s economic expansion. In January, part-time employment hit 25 percent on a 12-month running average and has since begun to decline, falling to 23 percent in June. But the level of part-time employment remained much higher following the recession, which ended in June 2009, than it did following the 2001 recession. In some cases, the increase in part-time employment reflects the re-entry into the labor force of people who needed to supplement income because the recession eroded retirement savings or the primary household breadwinner was laid off or relegated to part time as employers coped with the downturn. But the share of workers in part-time jobs even though they wanted but could not find full-time work more than doubled from 2007 and remained high into the recovery, likely a reflection of the structural shift toward service jobs in Idaho. There was an average of 35,000 involuntary part-time workers across Idaho in 2012 according to the U.S. Bureau of Labor Statistics – one of every five workers in part-time jobs. It is one of the reasons Idaho has such a high percentage of multiple jobholders – 7.4 percent in 2011. 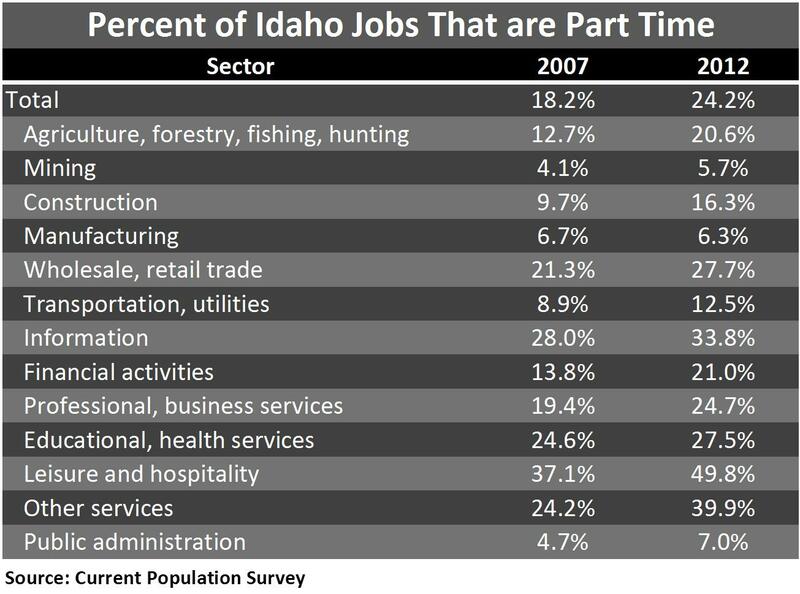 Idaho posted the third largest percentage point shift in the share of total jobs in the service sector from 2007 to 2012 – 3.9 percentage points behind Nevada and Arizona. In those five years, Idaho’s economic structure went from 81.3 percent service jobs to over 85.2 percent. The monthly Current Population Survey, conducted jointly by the U.S. Census Bureau and the Bureau of Labor Statistics, defines a part-time worker as anyone working between one and 34 hours during the survey week. The period of work must be the usual period of work and not an anomaly. The survey estimates not only workers in jobs covered by the unemployment insurance system, which averaged 623,000 in 2012 and 656,000 in 2007, but also the 90,000 people who are self-employed or work in noncovered employment. While part-time employment nationally increased nearly two and a half percentage points during the recession, it never exceeded 20 percent and has been slowly receding the past two years. Idaho was one of only eight states seeing percentages of part-time employment rise significantly during the recession and then remain over 20 percent in the recovery through 2012. The six percentage-point spike in part-time employment in Idaho was the biggest percentage-point increase among the states. It was matched by Nevada, where part-time jobs never hit 20 percent and where the rate has been falling the last two years. Manufacturing was the only major industrial sector to see a decline in the percentage of part-time jobs since 2007. Along with mining and government, manufacturing maintained a single-digit part-time job rate through the recession. The recession’s biggest impact was on jobs in other services like dry-cleaning, automotive services, various repair services and personal services. Part-time jobs in this sector jumped from under 25 percent to 40 percent. Leisure and hospitality, which includes hotels and restaurants, jumped from 37 percent part time in 2007 to almost 50 percent in 2012. Education and health care remained relatively stable, moving from just under 25 percent to 27.5 percent while the remaining sectors posted more substantial increases in part-time jobs. This entry was posted in Employment News and tagged Bureau of Labor Statistics, idaho department of labor, Idaho part-time workers, part-time jobs, part-time work on September 16, 2013 by Idaho Department of Labor.